Adenosine triphosphate (ATP) is a complex organic chemical that is found in every cell of the human body. ATP has been dubbed by scientists as the ‘currency’ of energy for life as virtually every physiological process that requires energy gets that energy from ATP, process like nerve conduction, biosynthesis, muscle contraction, and cellular respiration. Every process in your body, from metabolizing nutrients and cellular respiration, to the complex motion of your muscles when doing a tennis serve, is controlled by ATP and without it, the human body could not function properly. ATP was first discovered in 1929, independently by two separate researchers, the German biochemist Karl Lohmann and Indian biochemist Yellapragada Subbarow. It was originally proposed to be the molecule responsible for mediating energy processes in cells, and since its discovery, ATP has been implicated in a number of biological processes such as DNA synthesis, protein creation, intracellular communication, and even neurotransmission. 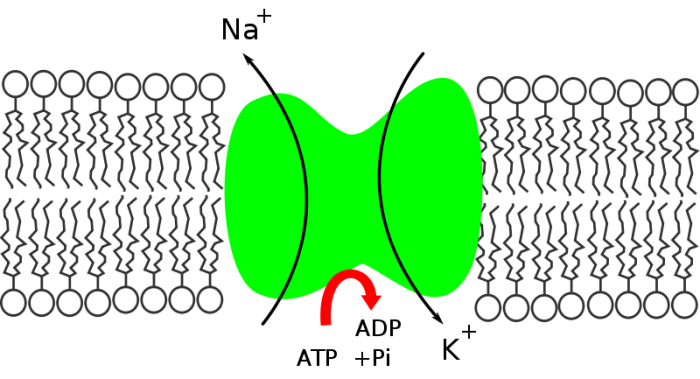 In 1997, the Nobel prize in chemistry was awarded to chemists John Walker, Paul Boyer, and Jens Skou for detailing the precise cellular mechanism by which ATP shuttles energy between cells. 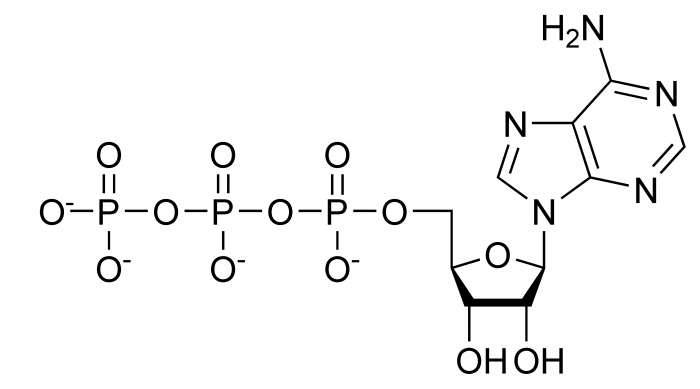 ATP is classified as a nucleoside triphosphate; that is, an organic molecule with 3 main components: (1) a nitrogenous base (adenine), (2) a ribose group, and (3) a phosphate group. The adenine base consists of a ring of bonded nitrogen and hydrogen while the ribose group is a monosaccharide (simple sugar) that serves as the backbone of the molecule. A diagram showing the three parts of the chemical structure of ATP: the adenine base, the ribose, and the three phosphate group. The phosphate groups are sometimes dubbed alpha for the first, beta for the second, and gamma for the third and terminal group. Source: WikiCommons. The connected phosphate group is the most important part of the molecule with regards to mediating energy-requiring processes. The phosphate group consists of 3 phosphorous atoms (hence triphosphate) connected to each other by oxygen atoms, with each phosphorous group also surrounded by oxygen atoms on either side. The three phosphate groups are called alpha, beta, and gamma, from closest to farthest from the main body of the molecule. The negatively charged oxygen atoms repel each other, so there is a lot of potential energy wrapped up in the chemical bonds of the phosphate group. That energy is liberated when one of the phosphate groups is removed and that energy can then be used to drive physiological processes. Most often, the gamma phosphate group is the one removed from the ATP molecule. When a phosphate group is removed, ATP is converted into adenosine diphosphate (ADP). 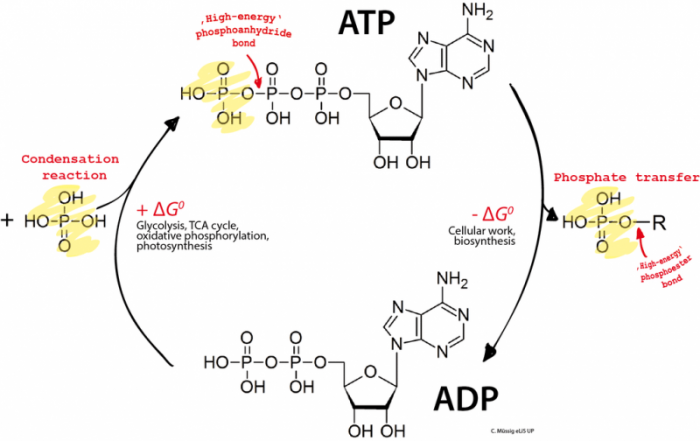 ADP is then later re-converted into ATP via phosphorylation (the adding of a phosphate group) and the process begins anew. In this sense, ATP molecules function a bit like batteries. The molecular ‘battery’ is ‘charged’ when it has 3 phosphate groups. Breaking the bond of one of these phosphate groups releases the energy and is analogous to using the battery and depleting its charge. ATP molecules are broken down via a hydrolysis reaction, a reaction mediated by water. ATP give energy to other chemical processes via reaction coupling. This means that they will transfer energy to another chemical reaction in the form of a shared intermediate, a product of one reaction that becomes the reactant for another reaction. For any chemical process, there is an associated energy ΔG which correspond to the amount of energy released or absorbed by the reaction. For two reactions that have a shared intermediate, one can combine those two reactions into a single larger reaction. ΔG of this reaction is just equal to the sum of ΔG of the other two reactions. As long as the total ΔG is negative, the total reaction can occur. The resultant ADP molecule is then ‘recharged’ by adding another phosphate group in a reverse hydrolysis reaction. The cycle of conversion from ATP to ADP then phosphorylation of ADP into ATP drives all cellular respiration in the body and is necessary to yield the high energy levels required for complex physiological processes. Given that ATP is necessary for a number of bodily functions, it is found in abundant quantities in the human body. The average intracellular concentration of ATP is 1-10 millimoles; that is, up to 6.02×1018 molecules of ATP per cubic millimeter. In general, the concentration of ATP molecules is 5 times greater than that of ADP molecules. In an average human, there is approximately 0.1 mol of ATP at any given time. Daily, the average human expends an amount of energy equivalent to the amount gained from the hydrolysis of 200-300 mols of ATP. In other words, each molecule of ATP in the average human body has to be recycled 2000-3000 times in a single day. In eukaryotic organisms, the majority of ATP production takes place in the cell’s mitochondria. It is produced mainly via two biological processes: glycolysis and citric acid oxidization. During glycolysis, the body breaks down glucose into pyruvate, and the release of energy is used to form ATP. In the citric acid cycle, also known as the Krebs cycle for those who remember high school biology, the energy released from the oxidization of fats, carbohydrates, and proteins drives ATP production. Acetyl-CoA is oxidized and the products from that reaction are used to phosphorylate ADP molecules. For every single molecule of Acetyl-CoA, the ensuing products from oxidization are sufficient to create 4 molecules of ATP. 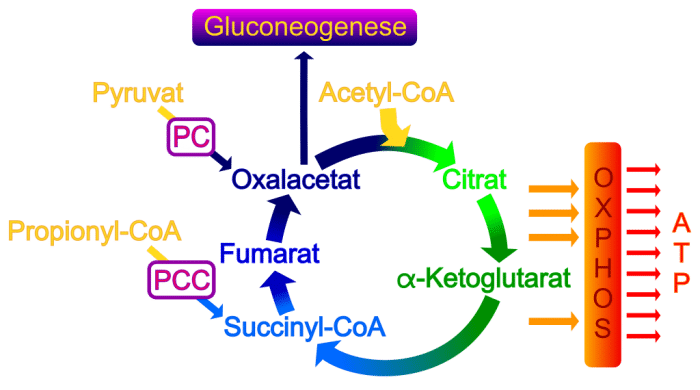 Both glycolysis and the Krebs cycle are important components of cellular respiration, the process by which cells extract energy from nutrients. A diagram showing the production of ATP from the Krebs cycle. The energy released from the oxidization of Acetyl-CoA is used to make ATP. Source: WikiCommons. The functioning of ATP explains why phosphorus is a necessary element in the diet of all living things. 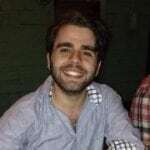 The unique chemical properties of phosphorus and the closely related chemical phosphate groups are among the only elements able to make stable complex organic structures that can yield the high energy reactions needed for complex life. For example, a commonly synthesized chemical analog of ATP is adenosine thiotriphosphate, in which one of the phosphate oxygens is replaced with a sulfur ion, an element in the same chemical family as oxygen. This synthesis is possible because sulfur has a similar valence structure as oxygen. Adenosine thiotriphosphate, despite being very structurally similar to ATP, cannot take place in the energy mediating reactions that ATP does. In fact, adenosine thiotriphosphate actually inhibits ATP-dependent processes as the presence of the sulfur ion dramatically slows the separation of the active phosphate group. Phosphorus is what makes life as we know it work. Despite only making up approximately 1% of the human body, every physiological process is due to phosphorus. Just like carbon, the unique chemical properties of phosphorus make it one of the necessary building blocks of life.